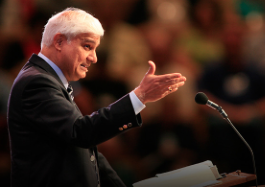 Ravi Zacharias becomes a Christ follower, on a bed of suicide. Testimony of Ravi Zacharias, Christian apologist, leading figure of the evangelical intelligentsia movement. I very seldom like to mention the turning point of my own life, for it is a very private matter and sometimes still hurts to think of it, to say nothing of the embarrassment it must bring my family. But I cannot resist thinking of that most poignant moment of my past. I was seventeen years old when, with neither great intensity or great anguish, I came to the recognition that life had very little meaning. The more I pondered its harsh implication the closer I drew to a decision. That decision was to choose the way of suicide. I found myself after that attempt lying in a hospital bed, having expelled all the poison that I had taken but unsure if I would recover. There on that bed, with a dehydrated body, the Scriptures were read to me. The flooding of my heart with the news that Jesus Christ could come into my life and that I could know God personally defies the depths to which the truth overwhelmed me. In that moment with a simple prayer of trust, the change from a desperate heart to one that found the fullness of meaning became a reality for me. God reached down to a teenager in a hospital bed in the city of New Delhi, a mega-city of teeming millions. Imagine! God cared enough to hear my cry. How incredible, that He has a personal interest in the struggles of our lives. I cannot express it better than to say that His self-sufficiency and greatness do not deny us the wonderful joy of being affirmed in our individuality and of knowing that we are of unique value to Him. That was the point of the parable Jesus told about the shepherd who left the ninety-nine sheep in the fold and went looking for the one. Extract: The Cries of the Heart, p. 121-2 (Scribd.com format), Ravi Zacharias.